MONTREAL, QUEBEC--(Marketwire - April 18, 2012) - Yorbeau Resources Inc. (TSX:YRB.A)("Yorbeau") is pleased to report that its technical team has identified two new gold exploration targets at its Rouyn property. The Company's drilling activities over the last five years have been focused on targets hosted by ultramafic rocks of the Piché Group, which led to the discovery of the Lake Gamble and Cinderella zones and to the preparation of a NI 43-101 resource estimate on the Augmitto target. While in-fill drilling continues at Lake Gamble in preparation for a forthcoming resource estimate later this year, field and compilation work on the rest of the property led to the recognition of promising new exploration targets in volcanic rocks of the Blake River Group. This work was in part initiated following the recent successes reported by Mines Richmont at the neighbouring Wasamac project where resources of 2.1 million ounces of gold have been identified in the measured and indicated categories. Work by the Yorbeau technical team was focused on two main structures located to the north of the Augmitto-Astoria corridor. The two structures consist of envelopes of quartz-carbonate veins and disseminated pyrite hosted by various carbonatized and silicified volcanic units of the Blake River Group. Similar volcanic units of the Blake River Group also host Richmont's Wasamac mineralization. The location of the newly identified structures is shown on the attached Figure 1 (http://media3.marketwire.com/docs/yoreng-1.jpg) and highlights of the targets are presented below. Based on mapping and review of drill core, the interpreted gold-bearing structure (the "Durbar structure") is at least six kilometres long and is parallel to the Lac Pelletier and Wasamac faults located respectively 1.2 km and 2.1 km to the north and which control Alexis Minerals' Lac Pelletier deposit and Richmont's Wasamac deposit. The Durbar structure hosts the Durbar gold deposit (historical resources of 56,000 ounces), several gold intersections in the northern portion of Yorbeau's Cinderella Block, and the historical Brochu gold showings. Old trenches located within the structure (Rollin showings) were visited and sampled by Yorbeau's staff in late 2011. Grab samples of quartz veins from the rollin trenches returned up to 12.6 g/t Au and a series of channel samples were also taken to cover envelopes of quartz veinlets with assays returning up to 4.85 g/t Au over a width of 1.3 metres. The true width of the mineralized zones cannot be established with accuracy given the large spacing between holes but it is likely less than the reported core length. In all cases, the mineralization consists of quartz-carbonate veining with traces of pyrite and common visible gold. The above holes are located over a strike length of approximately 800 metres and all intersected the gold bearing veins at very shallow depths (15 to 70 metres vertical) because the primary targets for the design of the holes were much deeper and the Durbar structure was only sporadically intersected as an added benefit whenever the holes happened to be collared far enough to the north. Given the potential importance of the Durbar structure, the Company intends to continue developing drill targets along it in the coming months, with drilling contemplated for later in the year or in 2013. Yorbeau's staff also re-evaluated an old gold prospect referred to as the Wright Rouyn prospect located in the north central part of the Rouyn property and is immediately adjacent to the past producing Stadacona mine. It is also strategically located where numerous important structures meet together, including the Smokey Creek, Stadacona, Stadacona East and Lac Pelletier faults. The Wright Rouyn prospect has been subject to sporadic exploration programs dating back to the early 1930's and the latest work consisted of diamond drilling by Yorbeau in 1984. As part of the evaluation of the Wright Rouyn target, Yorbeau staff dug out extensive unpublished data from its archives and also retrieved and re-examined the core from five drill holes that were drilled in 1984 and stored at the Company's work site. The data review showed that at least sixteen drill holes yielded significant gold assays over core lengths ranging up to 16 metres. Importantly, the old drilling only tested the mineralization at vertical depths shallower than 150-200 metres. Assay results from the sixteen holes, which have never been published, are tabulated in Appendix 1 attached herewith. The re-logging of five drill holes allowed confirmation of significant mineralized zones in each of the holes and led to key structural measurements which will help planning future follow-up drilling. The above check assaying is interpreted as having confirmed the historical assaying. Field and interpretation work is still on-going but it appears that the gold bearing quartz veins at Wright Rouyn are associated with at least two main faults, namely the Stadacona and Lac Pelletier faults. 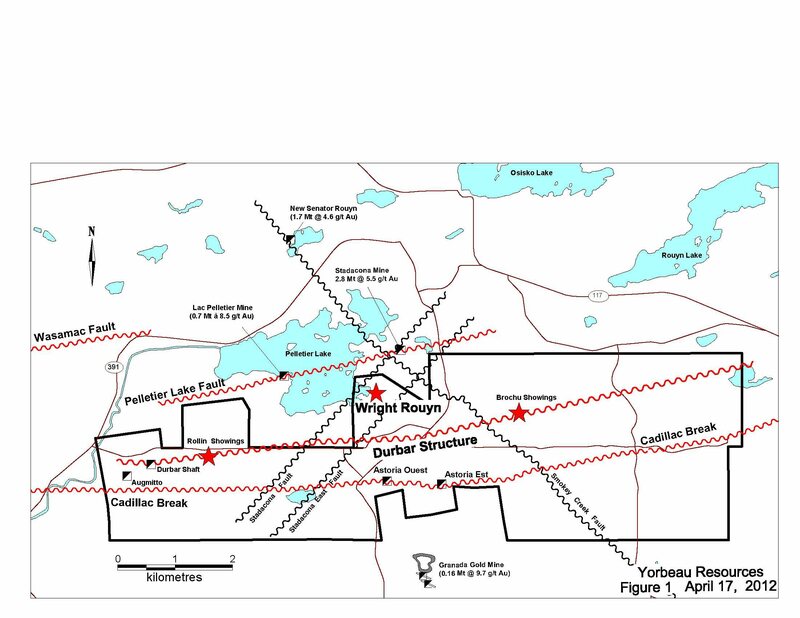 In addition to on-going infill drilling at Lake Gamble, the Company will continue to evaluate both the Durbar and the Wright Rouyn targets in order to prepare a diamond drilling program for later in the year or in 2013. Work planned in early summer includes mechanical stripping, geological mapping and sampling of trenches and stripped areas. Yorbeau's president and CEO David Crevier commented "We are extremely pleased with the recent results obtained by our technical staff and are looking forward to initiate further testing of these targets. We are confident that the work will add considerable value to Yorbeau's Rouyn property." Work is carried out by technical personnel of Yorbeau Resources Inc., under the supervision of Laurent Hallé, P.Geo. who has reviewed and approved the content of this release. He is a qualified person (as defined by National Instrument 43-101) and has more than 31 years of experience in mineral exploration. New assays referred to in this press release were obtained either at ALS Chemex Laboratories in Val d'Or, Quebec, or at AGAT Laboratories in Sudbury, Ontario. All samples are analyzed by standard fire assay. Samples returning more than 3 g/t are re-analyzed by fire assay with a gravimetric finish. Yorbeau has implemented a QA/QC program that consists of inserting blanks and gold standards in batch samples being sent to the assay laboratory. Selected pulp samples will also be re-analysed by a different laboratory. At this time, the Company has not done sufficient work to establish the true width of the mineralized zones with accuracy given the large spacing between holes. However, the true width is likely less than the reported core lengths. The re-sampling of selected intervals by Yorbeau staff was done in late 2011.